A simple call to SlimJim.Me Locksmiths will solve all of your car key replacement woes. With our 24/7 locksmith service offered nationwide and mobile locksmiths offering a 30 minute response time, you will be back in your car and on the road in no time. We can replace lost car keys, replace broken car keys, and even help you unlock trunks and car doors. 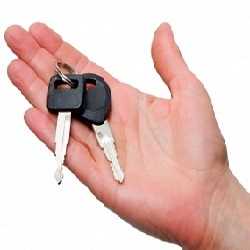 To avoid future car lockouts, our locksmiths can duplicate car keys on-site. Transponder Keys – Transponder keys are unique and were designed to help reduce auto theft. The key has a special transmitter that sends a signal from the ignition to the car’s on board computer system that allows it to start. The key must be made correctly so that the car will start. Laser Cut Keys – These are thicker, more precise keys that are cut with a laser. Car Fobs and Remotes – We can repair and replace car fobs that serve as keyless entry to your vehicle. We can also replace car remote batteries. Traditional Car Keys – Our service vans contain several key blanks made of high quality metals so we can cut keys for all makes of cars. We want our customers to be satisfied with the services that we at SlimJim.Me Locksmiths provide and guarantee work you will be pleased with in no time at all.